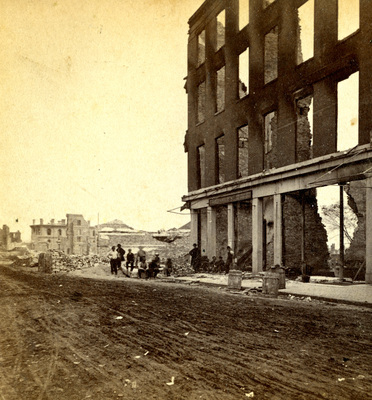 Post-fire ruins of lower Free Street, near Center Street, Middle Street Custom House in left background. "Looking Down Free Street" (1866). The Great Fire : 1866 - Stereoscopic views. 2. Portland, Me., Great Fire, Portland, Me., 1866., Free Street.